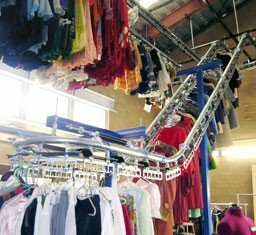 PACLINE offers enclosed track garment conveyor systems that can be configured to handle almost any hanging garment and can be installed in virtually any space requirement. This automatic storage and retrieval system can also be used to handle other hanging items such as printing dies, artwork for museums and other items that require cataloged storage and on-demand retrieval. 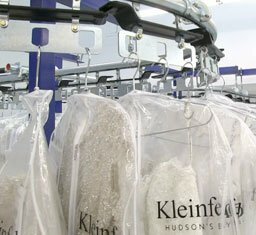 Full length gowns weighing up to 80 lbs in Bridal Salon storage area. Clothing transported to second floor and multi level conveyor storage area. 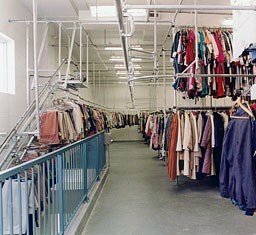 Floor to ceiling storage and retrieval for Theater Costumes utilizes minimal floor space. Each dual pendant rack can handle a load capacity of 100 lbs per foot. Dust shields are easily incorporated to protect garments and hanging items from dust and debris. 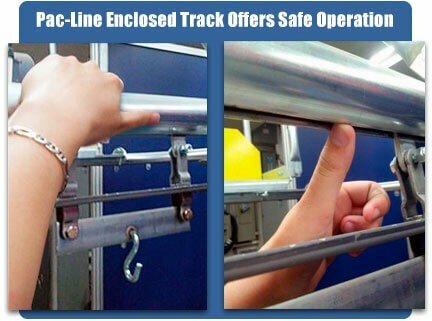 The PACLINE™ enclosed track design eliminates dangerous pinch points common in other conveyor designs. 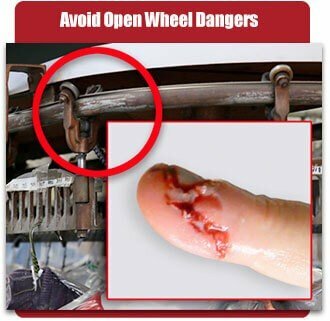 This is an extremely important consideration for garment handling systems where the hands and fingers of the operators can come in contact with the track and moving chain.